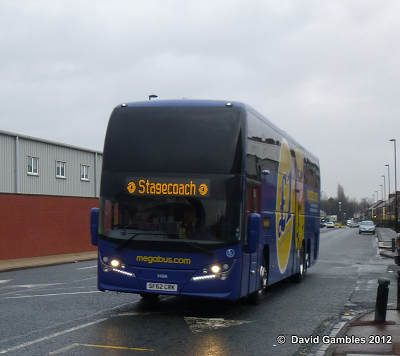 Stagecoach Newcastle have received a new Plaxton Elite i at Walkergate depot for driver training purposes. I was invited to photograph the vehicle earlier this week. The new vehicles are expected to be introduced into service on the megabus.com M20 route during January. front driver and passenger area. The aisle has a cut out section at the top of the steps leading to the washroom, so at this point the aisle is quite narrow.